Thousands of people, including a cadre of faith leaders from the Reconciled Church Movement (RCM), that represents various faith-based communities, joined the Rev. 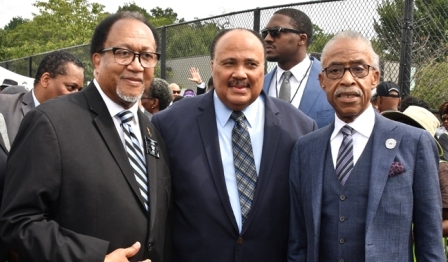 Al Sharpton and members of his nonprofit National Action Network (NAN) in Washington, D.C. to rebuke President Donald Trump and recommit themselves to the fight for social and economic justice. “Somebody has to have the courage to stand up and say, ‘this emperor has no clothes,'” Hatch said. “It’s time to take those statues down,” Cox said. “But leave the base so we [can] tell our children and our grandchildren what an evil wicked thing this country did.